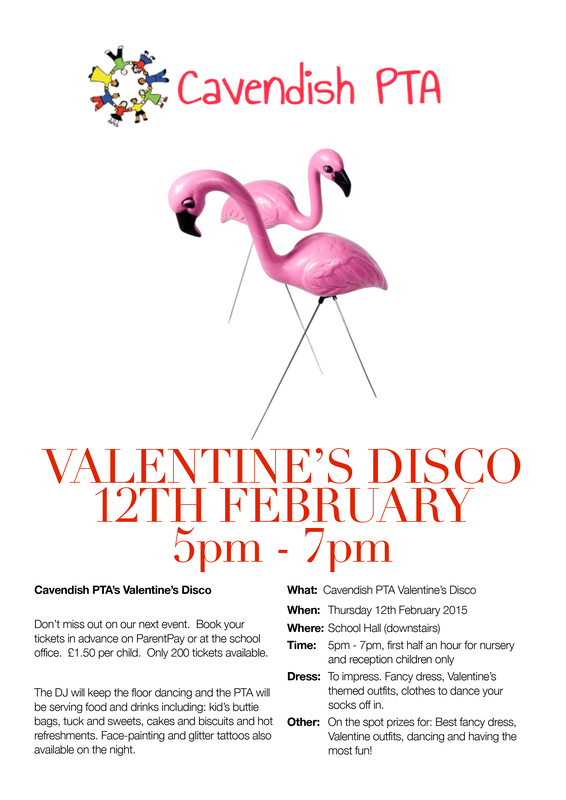 Don’t miss out on our next event – the hugely popular Valentines Disco, Thursday 12th February from 17:00-19:00 * – book your tickets in advance via ParentPay or at the school office. Tickets are priced at just £1.50/child – Strictly only 200 tickets available. The DJ will keep the floor dancing and your PTA will be serving food and drinks including; kid’s buttie bags, tuck and sweets, cakes and biscuits and hot refreshments. Face painting, glitter tattoos and other activities will also be available on the night. Due to limited capacity, tickets for this popular event MUST be purchased in advance, so don’t delay – www.parentpay.co.uk - What a great way to kick off the kid’s half term? This is a PTA event – Cavendish PTA and/or Cavendish Community Primary School cannot be held responsible for the direct supervision of children. NO UNACCOMPANIED CHILDREN ADMITTED.